The MGSW-24160F is implemented with advanced management functions, and provides 16 100/1000Mbps dual speed SFP Fiber ports and 8 10/100/1000Mbps TP ports delivered in a rugged strong case. It is capable of providing non-blocking switch fabric and wire-speed throughput as high as 48 Gbps in the temperature range from-10 to 60 degrees C without any packet loss and CRC error, which greatly simplifies the tasks of upgrading the enterprise LAN for catering to increasing bandwidth demands. The MGSW-24160F is specially designed for service provider to deliver profitable Ethernet network. Furthermore, it adopts “Front Access” design for easy technician wiring and maintenance of the MGSW-24160F in the cabinet. The MGSW-24160F helps the network administrators efficiently manage the unexpected network situations by providing Digital Input and Digital Output for external alarm device on the front panel. The Digital Input can be used to detect and log the status of the external devices such as door intrusion detector. The Digital Output could be used to send alarm whenever the MGSW-24160F has port link down or power failure. Nowadays, the need of IP address increases owing to lots of electronic products or mobile devices able to access to the Internet. However, the current IPv4 network infrastructure is not capable enough to provide IP address to each single users/Clients. The situation forces the ISP to build the IPv6 (Internet Protocol version 6) network infrastructure speedily. To fulfill the demand, the MGSW-24160F supports both IPv4 and IPv6 management functions. It can work with both original IPv4 network structure and the new network structure (IPv6) in the future. With friendly management interface and plenty of management functions included, the MGSW-24160F Managed Gigabit Switch is the best choice for you to build the IPv6 FTTx edge service and for Industrial Ethernet applications to connect with IPv6 network. The MGSW-24160F Managed Metro Ethernet Switch is ideal for applications in the factory data centers and distributions. It provides advanced Layer 2 to Layer 4 data switching and redundancy, Quality of Service traffic control, network access control and authentication, and Secure Management features to protect customer’s industrial network connectivity with reliable switching recovery capability that is suitable for implementing fault tolerant and mesh network architectures. The MGSW-24160F offers comprehensive Access Control List (ACL) for enforcing security to the edge. Its protection mechanisms also comprise Port-based 802.1x and MAC-based user and device authentication. The port-security function effectively limits the number of clients passing through, so that network administrators can now construct highly secured corporate networks with time and effort considerably less than before. By means of improving the technology of Optical Fiber Ethernet with high-flexible, high-extendable and easy-installation features, the MGSW-24160F offers up to 1Gbps data exchange speed via Optical Fiber interface and the transmission distance extends to 120km. The MGSW-24160F is the ideal solution for service providers such as ISP and telecom to build Metropolitan Area Network (MAN) based on the fiber technology to the WAN Internet Service. 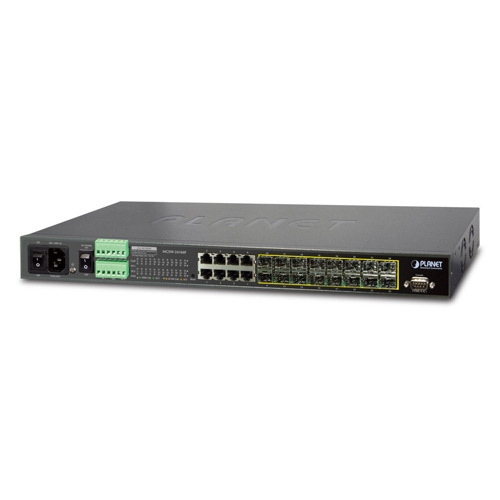 The MGSW-24160F is an excellent choice of core layer switch for a Gigabit network. With 16 100/1000Base-X SFP ports + 8 10/100/1000Base-T ports, the MGSW-24160F is able to connect up to 24 edge switches in the Ethernet environment. Moreover, it also provides 48 Gigabit per second switch fabric and high bandwidth for backbone connection. The MGSW-24160F features digital input and digital output functions that greatly help the administrator efficiently react to the emergency events. The digital input can be setup to indicate urgent events and send the messages or alarm to the network system once the urgent event detected by the external device such as door or windows open detector. The digital output function can define the immediate response such as port failure or power failure to the related urgent events. DI/DO 2 Digital Input (DI): Input Load to 24V DC, 10mA max.